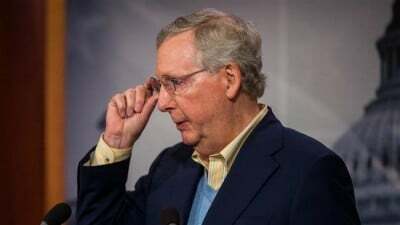 US Senate Majority Leader Mitch McConnell says that the legislative body is set to renew the Iran Sanctions Act (ISA) before the year ends. McConnell made the remarks on Wednesday, a day after the Republican-controlled House of Representatives voted almost unanimously to extend the ISA for 10 more years. “We’re going to take up the House bill. I think it’s already held at the desk and we are going to pass it,” he told reporters at the Senate’s weekly GOP leadership media conference. The House voted 419 to 1 to reauthorize the bill, which was first introduced in 1996 on the unfounded accusation that Tehran was pursuing non-civilian objectives in its nuclear energy program, an accusation that the Islamic Republic has adamantly rejected. Tehran argues that as a committed signatory to the nuclear Non-Proliferation Treaty (NPT) and a member of the International Atomic Energy Agency (IAEA), it has the right to use nuclear technology for peaceful purposes. If the Senate does indeed vote in favor of the extension before the end of next month, it would be up to President Barack Obama to pass it into law. Republicans say they are also planning to impose more sanctions against Iran, a move that Obama has advised against it as it would amount to a breach of a nuclear deal between Iran and six world powers. Iran and the five permanent members of the UN Security Council — the United States, Britain, Russia, China, France as well as Germany –started implementation of the deal, dubbed the Joint Comprehensive Plan of Action (JCPOA), on January 16. Under the JCPOA, all sanctions imposed on Iran by the European Union, the UN Security Council and the US have to be lifted as Iran limits some aspects of its peaceful nuclear program. It seems Donald Trump’s election as the next president of the US has allowed Republicans to take a more aggressive stance against Iran, specially after winning majorities in both the House and Senate. Trump said during his election campaign that he would “dismantle”, “tear up” or try to renegotiate the terms of the nuclear deal if elected president. Iranian officials have warned the US against walking away from the nuclear agreement, stressing that any US president is bound to honor the deal as it has been endorsed by a United Nations Security Council resolution, which makes it effectively an international law.